For lovers of the outdoors, with the arrival of summer comes the impulse to get outside and hit the water. Whether it’s relaxing along a lazy stretch of flatriver or navigating the pleasurable challenge of a Class III rapid, a canoe trip through one of Mother Nature’s original water parks offers a great, active way for you and yours to satisfy the urge. The Float: Put in at the public boat landing at Bent Creek, takeout at Dixon Landing in Buckingham County’s James River State Park—8 miles, 3.5 hours. 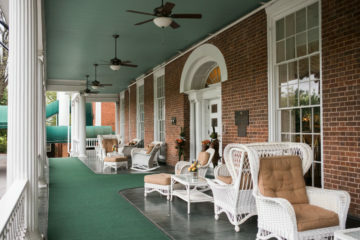 This trip lands you deep in the rural fringes of the county where the Civil War officially came to an end. While compared to its mountainous headwaters west of Lynchburg, the James in Appomattox is a little wider and much calmer, the river remains small enough to feel quaint, and it moves at a brisk enough pace to offer numerous riffles. The float snakes through a mostly isolated stretch of high Blue Ridge foothills with some small islands and the occasional rolling, sycamore-lined cow-pasture. Putting in at the public landing where U.S. Highway 60 crosses state Route 26, be sure to check out the stone ruins of the old bridge’s Civil War era pillars towering amid the current. The Livery: Outdoor Adventures offers canoe, kayak, and tube rentals plus shuttle. Canoes start at $40. The 1,561-acre park is known for its rolling grasslands, estuaries, thickly timbered forest and, of course, its 3 miles of shoreline. There are bath houses, upscale cabins, and primitive campsites. The latter are stretched along the river bank. The Float: Put in at the Bealers Ferry landing, takeout at the Burners Bottom landing—11 miles, 5 hours. Located along the northern reaches of the picturesque Shenandoah Valley National Park and winding along below Skyline Drive, this float is rife with picturesque scenery. While the Shenandoah’s southern fork is probably better known, the South Fork is a small, swiftly flowing river famous for its pristine clarity and gorgeous rocky beds. Meandering 100 miles over the course of about 20 road-miles, with stretches of fun, family-friendly Class II rapids, the float offers stellar landscapes, great opportunities for wildlife encounters, and plenty of interesting paddling. 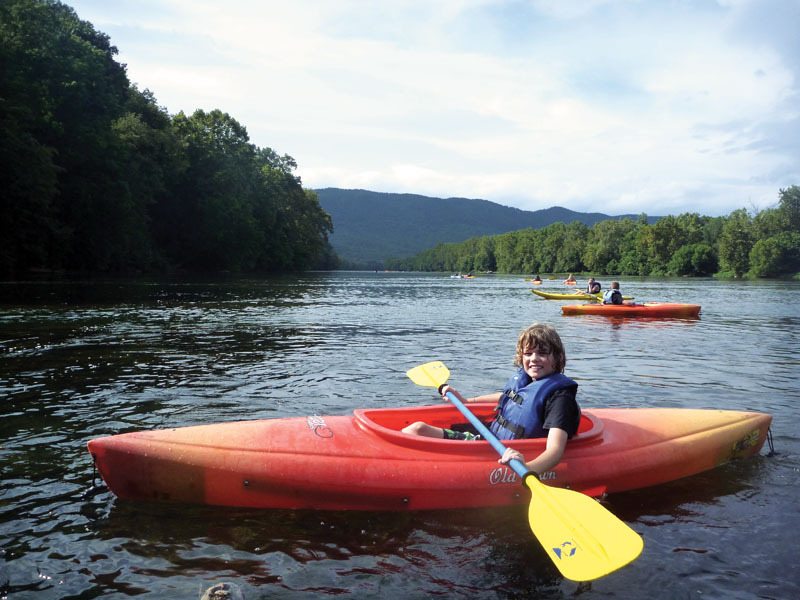 The Outfitter: Shenandoah River Outfitters offers canoe, kayak, raft, and tube rentals plus shuttle. Canoes start at $45. Camping: Shenandoah River Outfitters offers a range of log cabins and cottages—from basic to luxury—as well as primitive campsites on the edge of the George Washington National Forest. If you’re feeling adventurous, check out the overnight float option, which splits the South Fork’s 20 miles with a riverside camp in the middle. The Float: Put in at the landing at Stone Cliff in Thurmond (mile marker 26), takeout at the landing in Cunard—8.5 miles, 5 hours. Before things get all crazy and Class IV / V in the gorge, this trek along the upper New River alternates between Class I and II Rapids culminating in a Class III finale. If yours is a family of experienced canoeists, this venture makes for a swell little challenge. Otherwise, consider investing in a raft/guide package, enabling you to focus on the scenery while zipping along with children as young as age 5 in tow. The river moves swiftly through high hills with forests huddled along the banks. In the spring, you’ll spot the remnants of abandoned mining towns through the trees. 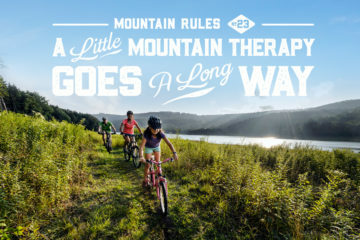 Additional perks of the route include a riverside trail leading to a waterfall, a fine tall rock to jump off into a deep swimming hole, and ruins begging to be explored. 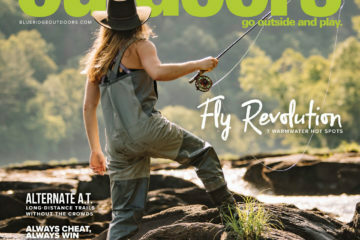 The Outfitter: Ace Adventure Resort provides guided rafting tours, including overnight trips that include an adrenaline-fueled run through the fantastically beautiful and technically engaging New River Gorge. Camping: If you’re doing your own thing, find an appealing spot about a mile upstream from Cunard in the New River Gorge National River Park and pitch a tent. 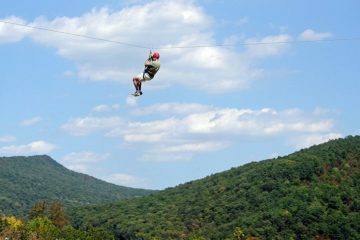 Otherwise, Ace Adventure Resort offers conveniently located cabins, campgrounds, bunkhouses, and deluxe accommodations. The Float: Put in at the public landing on North River Road, take out at Smoky Mountain Adventures—5.2 miles, around 3.5 hours. The Tuckaseegee is a fun little river located in the scenically dazzling Great Smoky Mountains of Western North Carolina. With stretches of nice, smooth water alternating with riffles, Class I and Class II Rapids, the Tuck is an excellent place to learn to paddle, work on skills, or enjoy a raft outing that’s sure to wow without scaring the crap out of younger children. The trip starts out along North River Road—where, for the adventurous, you can choose to tackle the Dillsboro Drop, a Class III rapid created by the dismantling of an old dam—then makes a big horseshoe bend into what’s locally known as the Tuck Gorge. About a mile into the float, the river passes beneath a Great Smoky Mountain Railroad overpass. The rapids pick up from there and don’t let up. Be on the lookout for numerous beaches, a great jumping rock, and the bald eagles that have begun to roost in the area. 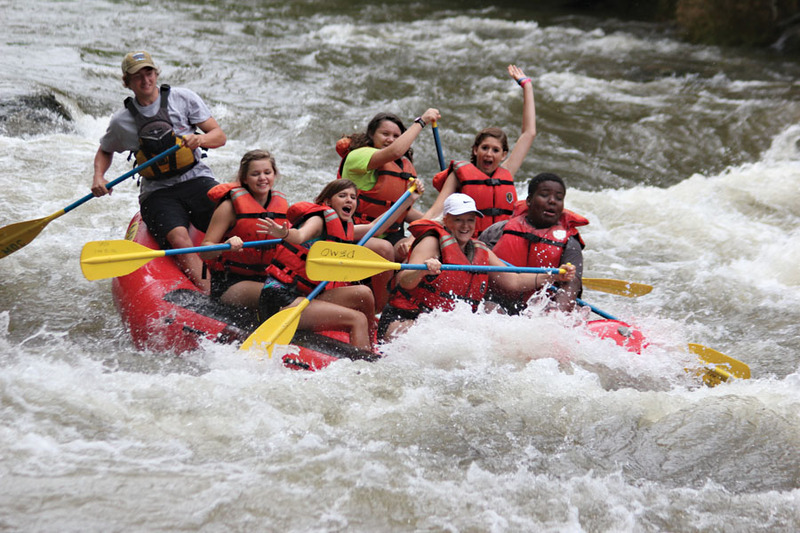 The Outfitter: Smoky Mountain River Adventures services include guided and self-guided rafting adventures, tubes, single/tandem inflatable kayaks, equipment, and shuttles. Self-guided rafting trips start at $17 for an adult and $12 for accompanying children. 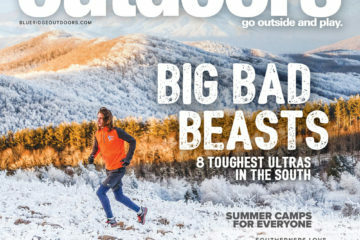 The Float: Start at the Bent Creek River access, end at French Broad Outfitter (or, for private runners, the Bywater)—slightly over 12 miles, 4 hours. Located at mile 72 of the French Broad Paddle Trail, this relaxed, mostly flatwater float will first carry you past the scenic beauty of the Biltmore Estate, and then transition into a cool urban-adventure float passing directly through Asheville’s River Arts District. As you drift through the Arts District, there’s greenway on one side of the river—with plenty of picnicking options—and then the Wedge Brewery, Smoky Park Supper Club (which constitutes the largest container structure in America), and the New Belgium Brewery along the other. Despite the urban scenery, the river is wild, pretty, and brimming with wildlife. Just downstream from the takeout lies the Bywater—a riverside club with grills for cooking out, bank-fronting activity area, full-service bar, and live music. 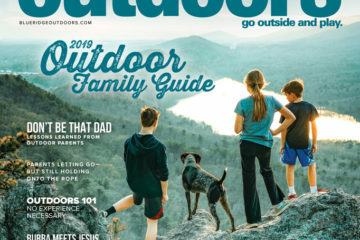 The Outfitter: French Broad Outfitters offers kayaks, canoes, and any equipment you might need. They offer longer, multiple-overnight turn-key packages as well. 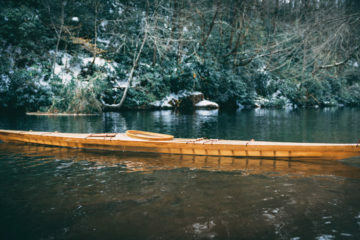 Canoes start at $50. Camping: Pitch a tent on one of the French Broad Paddle Trail’s paddle-in-only campsites. Camp areas are placed every 15 miles on islands and riverbanks. There’s a really nice one at Firefighter Island between milepost 58–59. 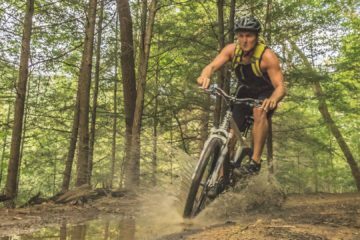 The Float: Put in at Deep Hole campground; take out at Sandy Bottom in the Chattahoochee National Forest—13.8 miles, 5–7 hours. This section of the Toccoa features beautiful clear water and flows in and out of the Chattahoochee National Forest. While the river passes through a couple of areas spotted with an occasional upscale cabin tucked away along the banks, by and large you’ll be winding through wild forests full of towering hemlocks. 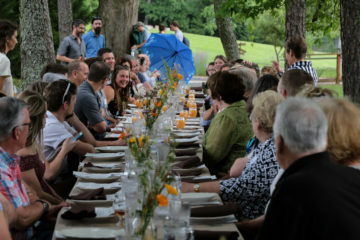 Wildlife abounds, as the CNF features over 500 species of plants, animals and fish—with highlights including the giant Hellbender salamander (which thrives only in the healthiest of freshwater environments), nesting bald eagles, otter, deer, and turkey. There’s an awesome rope-swing where Rock Creek meets the Toccoa and a really fun—but gradual—elevation drop once you’ve passed under the 270-foot-long suspension bridge via which the Benton MacKaye Trail crosses the river, offering slightly challenging Class II rapids at average water flow. The Outfitter: Jon Ron Toccoa River Outfitters offers canoes, kayaks, shuttles, and guided fishing adventures. Canoes start at $60. Camping: Pitch your tent along the river bank in any of the Chattahoochee National Forest areas or at one of the primitive sites at the takeout at Sandy Bottom. The Float: Put in at the landing in Tidioute; take out at the landing in Tionesca—15 miles, 5 – 8 hours. 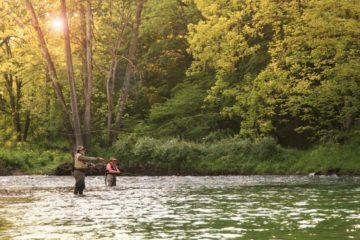 Located in the southwestern portion of the 517,000-acre Alleghany National Forest and at the northern reaches of the Alleghany Mountains, here the Alleghany River is wide and for the most part quiet, with a few beginner-friendly riffles. The adventure’s most prominent feature is a crazy abundance of islands (there are over a dozen of them), all belonging to the national forest, and all wooded and wild. The largest of the landmasses is 96 acres, with most clocking in at around 60 acres. When the water’s up in the early summer, this makes for great exploration, as many of the islands abut one another and frequently feature as many as four or five bisecting forks. While the river averages about three feet in depth through this stretch, be on the lookout for tall boulders offering a nice leap into the cool waters of many a swimming hole. The Outfitter: Outback Adventures offers canoes, single and tandem kayaks, shuttles, and overnight adventures as well. Overnight journeys range from one to three nights out, and can cover between 15–53 miles. Camping: Primitive camping is available on the islands or shorelines of the national forest. Outback Adventures offers teepees and cabins with luxurious amenities. The Float: Public boat landing at Harris Creek to Red River Adventure—8 miles, 3.5 hours. Tucked way back in the rugged hill-country of remote Kentucky, this float will have you navigating through the dense woodlands of the Daniel Boone National Forest and the gorgeous Red River Gorge. Designated by the U.S. Park Service as a national geological area, the gorge is known for housing an array of over 80 natural stone arches and limestone rock faces. From the Red River, you’ll have the opportunity to catch views of these towering cliffs and amazing formations from angles otherwise unavailable. Beachy sandbars and the occasional huge boulder sitting directly in the river bed and towering over a perfect swimming hole offer excellent diversions along the way. The Outfitter: Red River Adventure offers canoes, kayaks, shuttle and other various outfitting equipment. Canoes start at $30. Camping: Red River Adventures runs a primitive campground located directly on the river with a small store, bathhouse, and personnel on-site and available 24 hours a day. Wear a life jacket or Personal Flotation Device. Check river levels and weather forecasts prior to your trip. High water can make certain sections dangerous or unnavigable. Low water can lead to dragging and excess portaging. If you capsize—don’t panic! Float on your back, feet first. Work toward the bank or find a good slow stretch of water before trying to stand. Avoid boozing—alcohol plays a role in most accidents and drownings. Wear shoes to protect your feet against glass, fishhooks, and sharp rocks. Scout unfamiliar rapids from the shore and talk with your boat-mates before you run them. Kneel to provide stability when running rapids and riffles in a canoe. Keep the river clean by carrying out everything you bring in—including fishing line and cigarette butts. Carry out extra trash whenever possible. Respect private property owners—try to avoid camping or trespassing on private land. 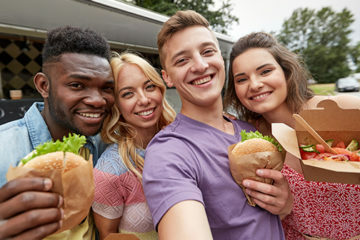 Pack a cooler with a picnic lunch, all your favorite snacks, and plenty of drinking water. Avoid bringing glass containers on the river. Camp at least 100 feet from the nearest water source. When you need to potty, bury waste 300 feet from the nearest water source. Build fires where fire pits already exist and burn dead wood salvaged from the ground. 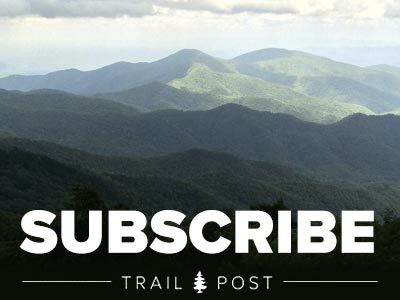 Previous ArticleSlatyfork, Enduro, WVMBA, Poca Trails – Hard to get much better than that.